We put in a courtyard a couple of years ago and I'm mainly focusing on ornamentals there, but I'll have a few raised beds for some veggies - love tomatoes just off the vine! And, I grow comfrey, black berries, a handful of herbs, but no cukes or squash this year. In the orchard, the peach trees are in full bloom, but the apple trees are not yet blooming. We have an apple tree which is blooming. out of control and had very few good apples. and in-laws love rhubarb pie. I need to spray our apple and peach trees too. I use neem oil, which is organic and it seems to help. So true about tomatoes getting big in containers - if I could only grow one thing, it would be a tomato plant. I agree on rhubarb -- I don't cook it -- but I am growing three plants for their leaves. I planted them too late last summer and only got one decent leaf that wasn't torn up by the wind. I made this out of concrete. 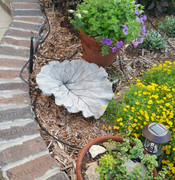 But, I need more leaves in order to make the water fountain I want to make, so hopefully this year the wind won't tear them up before I get a chance. very artistic and talented indeed. I like gardening....to do it myself but I had a part time garden person who came in and did what I didn't have time to do. Came to love her as a dear friend.....she was in her mid to late 40s when she started to work for me.. A couple years ago she came down with lung cancer and then died unexpectedly with a heart attack. I miss her. So what i'm getting at is that I've torn out a bed without her and now i'm trying to decide what to put back in it. I like some of your picture ideas...especially that big flat planter bottom with the rocks and low growing....what? succulents?? I think I can incorporate that. Yes, those are succulents. They like sandy, gravely soil and they don't need a lot of water. Sorry to hear about your garden helper, it's tough doing it all alone. I just pruned my 5 year old apple trees yesterday, they look very happy. I planted 100 tulips and daffodils last fall which are coming up nicely. Nothing is more beautiful than a bed of tulips when they burst into bloom! I only have a handful, but one that never seems to die-off is a pretty red tulip my son brought (smuggled) to me from Amsterdam over a decade ago. Pruning apple trees is a necessary evil, and they'll love you for it. You're probably growing semi-dwarf? I think ours might be just one year older than yours. We just thinned out buds on the peach trees, but the apples haven't bloomed yet. Yes! Creeping phlox! When they bloom, they add such a bright burst of color to flowerbeds and rock gardens. I don't currently have any - but I love them! Page created in 0.982 seconds with 28 queries.